Walk 5 hrs on GR10 via Col d'Ayous (2185m) to Refuge d'Ayous (1960m). Shorter route: Stay on bus until Col de Somport (1631m) and walk ~3 hrs via Col des Moines (2168m) to the Refuge d'Ayous. Optional peak Pic d'Ayous (2228m) about 35 mins return from the col. Walk 4½ hrs on HRP via unnamed pass (~2100m) and Col de Peyreget (2300m) to Refuge de Pombie (2032m). Variant R at Lac de Peyreget via Col de l'Iou (2194m) avoids "perhaps slightly unpleasant" (scree?) climb to Col de Peyreget. Walk 5 hrs on HRP via road crossing (1350m) and Col d'Arrious (2259m) to Refuge d'Arrémoulit (2305m). Variant L at Col d'Arrious via path junction (2090m) avoids Passage d'Orteig (protected path), +½ hr. Walk 3½ hrs on HRP variant via Col d'Arrémoulit (2448m) into Spain and Refugio de Respomuso (2200m). Optional peak Pic d'Arriel (2824m) about 1 hr return from the col. Walk 4¼ hrs on HRP (snow, scree) via Col de la Fache (2664m) back into France and Refuge Wallon (1866m). Optional peak Grande Fache (3005m) about 1½ hrs return from the col, "steep but not difficult", some easy scrambling. Walk 5 hrs on HRP via Col d'Aratille (2528m) and Col des Mulets (2591m) to Refuge des Oulettes de Gaube (2151m). In Spain between the cols. 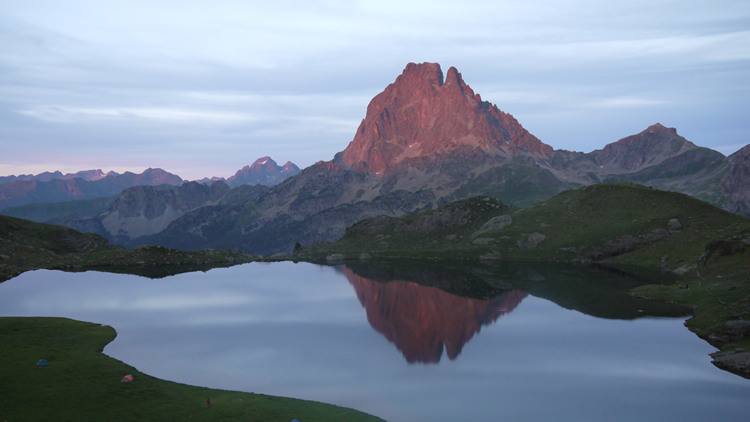 Walk 2½ hours on GR10/HRP via Hourquette d'Ossoue (2734m) to Refuge de Bayssellance (2651m). Optional peak Petit Vignemale (3032m) about 1½ hrs return from the col.
Mon 9 July Walk ~5 hrs via Barrage d'Ossoue (1834m) and Puerto de Bernatuero (2336m) into Spain and to San Nicolás de Bujaruelo (~1300m). Walk ~3 hrs on various roadside paths (GR11, GR15) (11km) to Torla (~1000m). Walk ~5 hrs via Mirador de Carcillarruego (~1900m), Faja de Pelay, and Rincón de Soaso (~1750m) to Refugio de Goríz (2200m). Alternative is the valley route (GR11) 3½ hrs. Walk 3½ hrs via Brèche de Roland (2807m) into France and Refuge des Sarradets (2587m). Optional peak Pic du Taillon (3144m) about 2hrs return from the brèche. 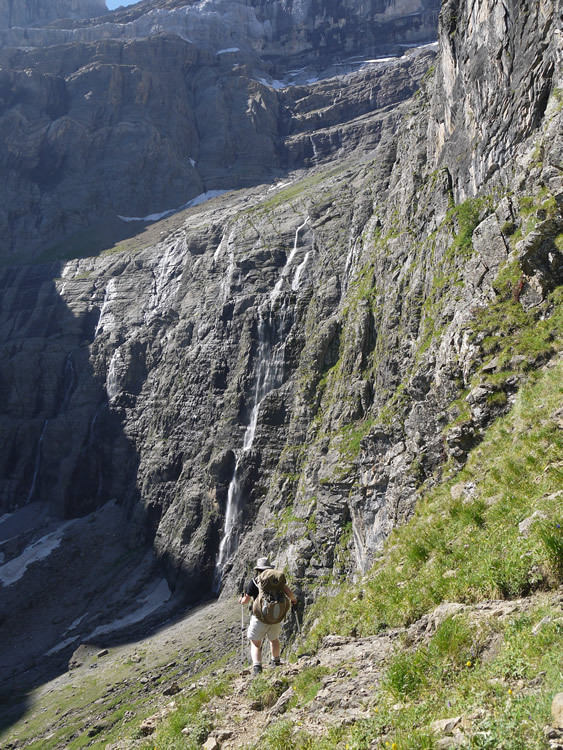 Walk 3½ hrs via l'Échelle des Sarradets and Cirque de Gavarnie to Gavarnie (1365m). 18:20 bus arr. Lourdes 18:55. Also buses at 11:25, 18:10. Collect next day's train tickets at station.